PARIS • Nine-time French Open champion Rafael Nadal pulled out of the tennis Grand Slam event yesterday because of a wrist injury. "I have a problem with my wrist... yesterday I played with an injection, I could play but yesterday night I started to feel more and more pain and today I felt I could not move my wrist," an emotional Nadal, the fourth seed, told reporters at a hurriedly arranged news conference. "It's not broken, but if I continue to play it will be broken in a few days. This is a very bad position, but that's life. "If this was not Roland Garros I probably wouldn't take the risk of playing in the first couple of days." The dejected Spaniard showed no signs of the injury during his 6-3, 6-0, 6-3 second-round win over Facundo Bagnis on Thursday. This is the latest setback the 29-year-old has suffered in an injury-plagued career. Tendinitis in his knees prevented him from defending his Wimbledon title in 2009, while the 2008 Beijing Olympics gold medallist also missed the 2012 London Games because of injury. 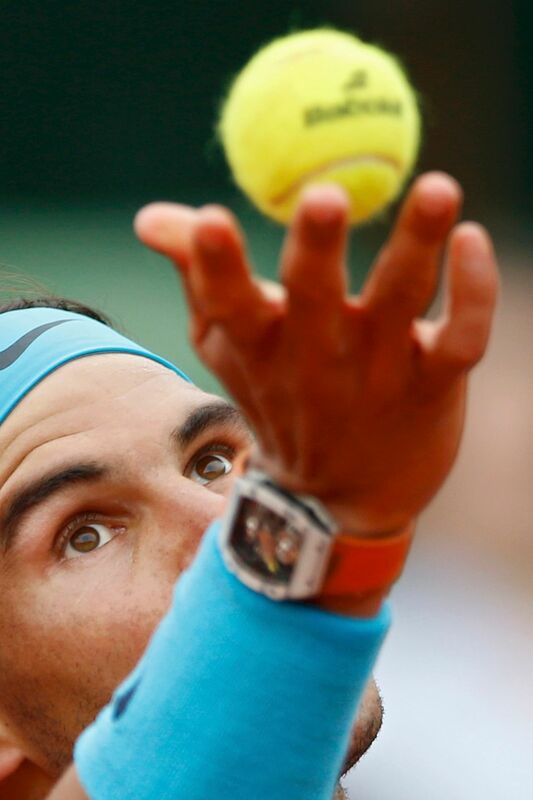 Nadal said, however, that he hoped he would be fit to play at Wimbledon next month. Earlier, Andy Murray dismantled the walking crane that is 2.10m-tall Ivo Karlovic in just under two hours to reach the fourth round of the French Open. It was as if his 10-set survival course against old Radek Stepanek and young Mathias Bourgue earlier in the first week was no more than a bad dream, and he can now concentrate on the serious part of the assignment with the confidence he brought from Rome as the new Italian clay champion. This was Murray's first match on the dirt against the 37-year-old from Croatia, the first six meetings having gone his way on grass and hard courts. And he was pleased to get the job done 6-1, 6-4, 7-6 (7-3) to topple the oldest player left in the draw - after the Scot had eliminated 37-year-old Stepanek in the first round. Milos Raonic (Can) bt Andrej Martin (Svk) 7-6 (7-4) 6-2 6-3 Andy Murray (Gbr) bt Ivo Karlovic (Cro) 6-1 6-4 7-6 (7-3), Albert Ramos-Vinolas (Esp) bt Jack Sock (USA) 6-7 (2-7) 6-4 6-4 4-6 6-4. Garbine Muguruza (Esp) bt Yanina Wickmayer (Bel) 6-3 6-0, Simona Halep (Rou) bt Naomi Osaka (Jpn) 4-6 6-2 6-3, Irina-Camilia Begu (Rou) bt Annika Beck (Ger) 6-4 2-6 6-1, Shelby Rogers (USA) bt Petra Kvitova (Cze) 6-0 6-7 (3-7) 6-0, Samantha Stosur (Aus) bt Lucie Safarova (Cze) 6-3 6-7 (0-7) 7-5. "It was very close in the third set," Murray said courtside. "Got off to a quick start, but he fought right to the end. I was glad to win the tie-break for a fairly quick match. I just tried to stay patient and take care of my own service game." Statistics showed Karlovic had won 95 per cent of his service games in the last year, more than any other player, but that counted for little on Court Suzanne Lenglen. The Croatian was 0-4 down in quick time, as Murray toyed with the oldest man to reach the third round of a Grand Slam for 25 years. The Scot even managed to send a couple of lobs looping over the head of Karlovic, who looked jaded after coming through a five-setter in round two. Having taken the second set with a single break, Murray's progress slowed in the third as the Croat found his range to force a tie-break. But the world No. 2 stayed focused and wrapped up a no-nonsense win on the first match point when 27th seed Karlovic sprayed a forehand well wide. Murray will face either big-serving American 15th seed John Isner or Russian Teymuraz Gabashvili next. Canada's eighth seed Milos Raonic overcame a left hip injury to defeat Slovakian lucky loser Andrej Martin, the world No. 133, 7-6 (7-4), 6-2, 6-3. In the women's draw, Simona Halep avoided the embarrassment of falling victim to a teenager who calls herself "a child of the Internet" as she huffed and puffed her way into the fourth round with a 4-6, 6-2, 6-3 win over Naomi Osaka. The Romanian was totally bamboozled in the opening set by a Japanese opponent ranked 101st in the world. However, the sixth seed made sure she did not suffer the same fate as Australian Open champion Angelique Kerber, fifth seed Victoria Azarenka or 10th seed Petra Kvitova, who was beaten 6-0, 6-7 (3-7), 6-0 by American Shelby Rogers yesterday. She kept her wits about her despite a barrage of winners flying off Osaka's racket and set up an intriguing fourth-round showdown with 2010 runner-up Sam Stosur, who edged out last year's runner-up Lucie Safarova 6-3, 6-7 (0-7), 7-5.